A company that provides healthcare services across the U.S. was looking to build more traffic to the website and generate quality leads. The company understood that even with something as cecsonal as healthcare, people are going online first to find a care provider who understands their needs. In fact, this is especially the case with healthcare. People are likely to seek answers online before admitting to their peers or family that they might have an issue. Google estimates one in 20 searches online are for health-related queries. 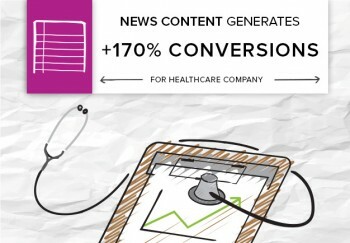 We created a custom content marketing strategy for the company’s target audience that act as a guide, bringing patients the answers they’re looking for online to the providers who can give them the care they need. And through this approach, we’re helping the brand reach that goal – one diagnostic test and appointment request at a time. We recently saw that the news content we create for the website is generating 170 percent more conversions quarter over quarter. And while the net number of conversions it contributes to the sales pipeline is lower than the website as a whole (news readers account for 10 percent of all traffic that on the website, the conversion rate is actually 3 times higher). Visitors who come to the site and read the news content are 3x more likely to get in touch with the company and become a customer. The success of the blog isn’t isolated. It’s also contributed to the website’s overall effectiveness. Since the start of 2015, the number of goal completions has increased 217 percent. 1. We worked with the company to understand its audience’s concerns and questions. We then turned these into topics for the news content that the company could publish on its website. This might sound simple, but it’s an important step in lead generation. The CMO council recently published a report that found 48 percent of marketers lose leads because their content wasn’t really developed for their target audience. It’s hard to get prospective customers to hand over their contact information or schedule an appointment when you can’t demonstrate that you understand their wants and needs in a blog post. Get the content right, and you have a foot in the door with your future clients. 2. We made an offer the target audience couldn’t refuse. The articles attracted readers with relevant information, and the site promised to help them determine what kind of care they need (if any). This one-two punch gives readers an easy way to satisfy their curiosity and also provides a next step that visitors can easily take. It’s easy to overlook navigation when you’re working to generate more leads, but it’s true that you won’t generate any leads if people don’t know how to convert. You might have built up an audience of interested prospects, but they can’t become bonafide business leads – or in this case, new patients – if there’s no intuitive way to connect further. Make sure there are calls to action (CTA buttons) next to your blog that clearly communicate what viewers should do if they are interested in learning more, scheduling an appointment or contacting your customer service team. Despite the marketing lore, there is no magic formula for more leads. The only secret is to put in the work getting to know your customers, learning what matters to them and making it easy for them to get what they need. This company is demonstrating its client-centricity with a content marketing strategy that educates patients about their healthcare concerns, and that strategy is 170 percent strong.